Taipei, March 21 (CNA) President Tsai Ing-wen (蔡英文) said on Thursday that she will do everything in her power to ensure Taiwan stays on the right path and shines on the world stage, before leaving on a visit to three of Taiwan's Pacific allies. 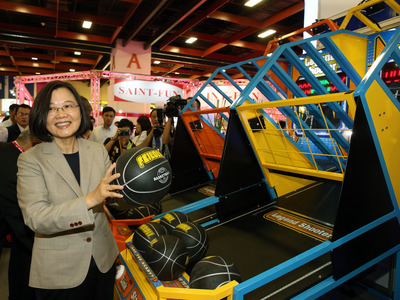 Tsai made the comment at Taiwan Taoyuan International Airport, the nation's main gateway, before embarking on her trip to Palau, Nauru and the Marshall Islands. The president said her trip has several goals, including promoting cooperation between Taiwan and its allies and boosting Taiwan's international participation. While Taiwan has expertise in agriculture, medical treatment and technology development to share with its allies, Tsai said, those countries can support Taiwan's participation in international organizations and events. Tsai said she seeks to gain better knowledge of the efforts and contributions Palau and Nauru have made in the field of sustainable development, which could serve as a useful reference for Taiwan. She will also exchange ideas with leaders from the Pacific region while attending the Pacific Women Leaders' Coalition Conference, which will be held on March 26-27 in the Marshall Islands. The other goal is to ensure that Taiwan's diplomats, technicians and doctors, who work around the clock in Pacific countries, receive greater recognition at home for their hard work. According to the Ministry of Foreign Affairs, Tsai will visit Palau March 21-23 and Nauru March 24-25 before arriving in the Marshall Islands March 26, and will make a stopover in Hawaii on the return leg of the her trip. The President is scheduled to return to Taiwan at 8:20 p.m. on March 28.